Police in Northern Ireland arrested four men on Sunday in relation to a car bomb attack outside a courthouse in the city of Londonderry. 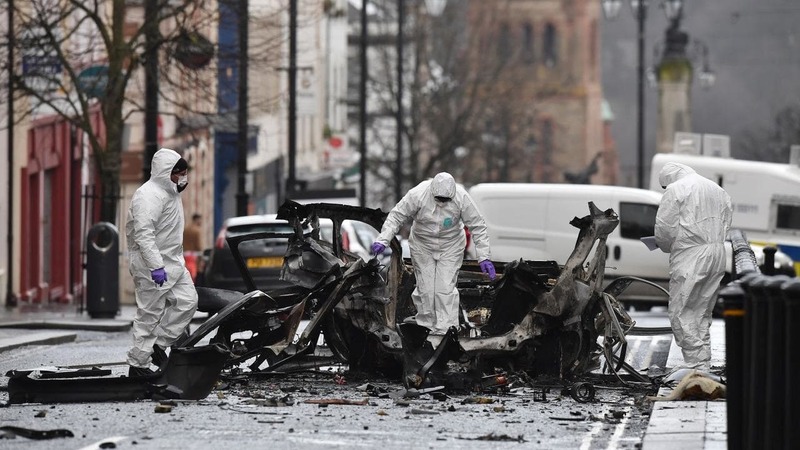 Detectives investigating the explosion, which occurred late Saturday outside the Bishop Street courthouse, arrested two men in their 20s early on Sunday, Police Service Northern Ireland said. A further two men, aged 34 and 42, were arrested in Londonderry later in the day. All four were being held in police custody. No further information was released about the men. PSNI Assistant Chief Constable Mark Hamilton said the attack was “unbelievably reckless,” adding his voice to widespread condemnation from politicians on all sides. Hamilton said the dissident republican group known as the New IRA (Irish Republican Army) was suspected of being behind the attack. “Our main line of inquiry is against the New IRA,” Hamilton said, according to Britain’s Press Association. Hamilton said police received a warning that a bomb had been placed outside the courthouse as they were checking another suspicious vehicle in the city, which is known as Derry by Irish Republicans opposed to British rule. “At this stage it appears as though the vehicle used had been hijacked from a delivery driver in the Quarry Street area a short time before the explosion,” he said. “Thankfully the attackers failed to kill or injure any members the local community out socializing and enjoying the best of what the city has to offer,” he added. “Despite last night’s reckless attack we will continue to work together to build on the significant progress made economically, physically and socially in our region in recent years,” John Boyle, the city’s mayor, tweeted. In a separate incident, police found a suspicious device in a wooded area near a housing estate in West Belfast on Sunday, the newspaper said. Residents living near Londonderry’s Bishop Street were evacuated late Saturday as police, firefighters and the ambulance service sealed off the scene. British Northern Ireland Secretary Karen Bradley said the attack was an “attempt to disrupt progress in Northern Ireland” following a 20-year peace process that ended decades of sectarian violence. The attack evoked the dark days of the Troubles, when Northern Ireland was riven by sectarian conflict for 38 years. Catholic nationalists, or republicans, sought a united Ireland and Protestant Unionists, or loyalists, sought to remain in the United Kingdom. The number of reported attacks declined after the Troubles were brought to a close in 2007 through a peace process that led to power sharing in the territory, however some fringe groups have rejected the agreement.